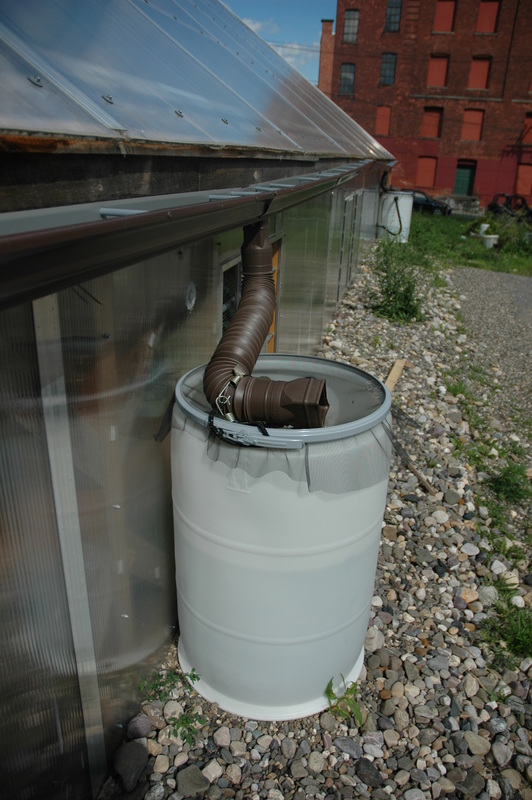 The system is designed to catch water off the roof of the greenhouse ( a substantial 1,200 square feet). Rain is caught in a series of gutters along the front kneewall that drain into two 55 gallon barrels. 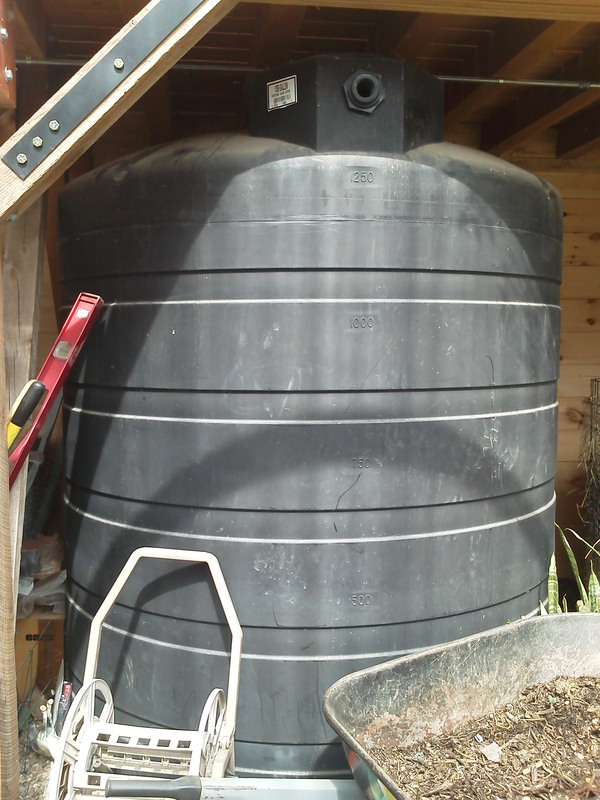 When the barrels are full, a pump with a float switch turns on and pushes the water into each of the two 1,300 gallon cisterns located inside the greenhouse. The system is designed to provide us with enough H2O to make it through the summer, and the rest of the year as well. 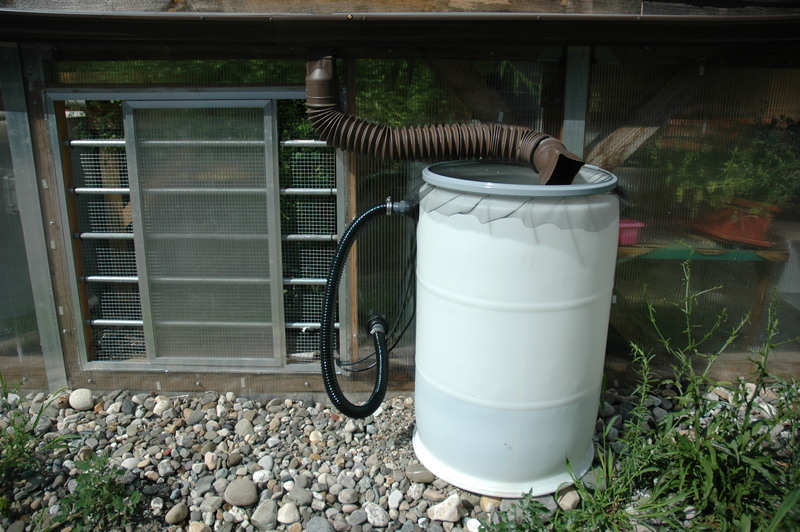 Rainwater is one of the cleanest types of water there is, with many of the pollutants found in surface and ground water distilled out through the hydrological cycle. Best of all, it’s non-chlorinated, which is essential for organic gardening, fish, mushrooms, biogas, and just about everything involving microbial processes. Here’s the formula we use for determining the catchment potential of a roof: (0.6 gallons of water) x (square foot of roof space) x (inches of rain). Figure out these numbers and you’ll know how much water you could collect off any particular roof in a year.